Hot this week: The Santa Maria: Lost and found…by a looter? British man, great grandson of one of the British soldiers who fought in Benin in 1897, to return two looted items to the Oba of Benin, His Majesty Omo N’Oba. Interview with the Prince about their efforts to track stolen antiquities and have them returned to Nigeria. (13 May 2014, Ahram Online)Two holes filled with antiquities that had been stashed by thieves were discovered by police. Middle Kingdom items. A rather standard article. Light overview of some folks involved with anti-looting in Egypt. Nothing new. Allegations that 15 pieces of porcelain in these dutch museums were taken from the Gutmann family. Profile of collector Baron Lorne Thyssen-Bornemisza de Kászon who has opened another antiquities gallery in Mayfair, London. Two gargoyles recovered by Norfolk police came from somewhere (a church? a mausoleum?) but where? Taken from a business in Westminster Business Square, Durham Street while the office was unstaffed. How the museum was able to remove the writing of an art vandal. Had been looting sites like German subs and unknown East India Co. ship for years using dynamite etc. The Omnibus by Honore Daumier returned to Hugh Lane Gallery in Dublin after being found by police, probably during a wider investigation into something else. It was stolen in 1992. (13 May 2014, RFI)After 5 men broke into the Jules Cheret museum in Nice in 2007, a sting operation involving Bob Wittman (ex FBI) led to their arrest and sentencing in 2011. Convicted thief says undercover FBI sorts pushed him to rob the place. Probably not worth much. Found by looters in Corum’s Sungurlu district in 2012, the sarcophagus was damaged by looters trying to enter it. Another tumulus was illegally excavated this March. New book on identifying fake paintings in Indonesia after allegations of forgeries in museums. Illegally taken during the Korean war and returned last week. A museum representative sent to the Cambodian site has ruled it out as the statue’s source because a resin facsimile of the base of the statue doesn’t match two known sets of statue feet. But museum says that this doesn’t mean it wasn’t illegally looted elsewhere. Barry Clifford says the wreck has been looted and needs immediate preservation, but is he, himself, a looter? No looting info offered in the piece. Discovery of Columbus’ Santa Maria: What Happens Next? What happens when commercial salvagers find a shipwreck and what SHOULD happen. Painting by Serge Poliakoff was repatriated to Brazil from the US after it was found to have been smuggled. Discovered as a result of civil actions against an imprisoned Brazilian banker. An interesting piece on the looting of Native American sites and some of the motivation behind collecting those items. Court case to decide who has exclusive rights to ‘salvage’ (read, commercially loot) the SS Central America wreck. Specifically talking about returns to Korea following return of looted seals last month. More on the continuing saga of the Iraqi Jewish Archive seized by US Soldiers in a flooded Baghdad intelligence centre. 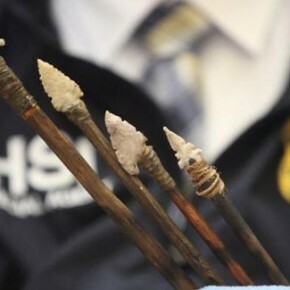 Native Alaskan objects are popular at auction, and Native Alaskan tribes are active in trying to get auctions stopped and sacred pieces returned. “It’s time to revisit the issues around provenance” says the president of Museums Australia. Paywalled. More on the National Gallery of Australia’s issues with stolen Indian idols. Items taken include 17th century mirror and timber screen and a gem encrusted cross. About 30 items taken. Rare orchid theft is something that we should be talking more about. I admit it is a bit of a side obsession of mine. Fossil samples stored in derelict steelworks site were destroyed after the metal containers they were in were set alight. Were being collected for a heritage and visitor centre. Criminal impersonation charges and forgery charges upheld against man who impersonated academics in order to discredit their work on the Dead Sea Scrolls. Was cleared of other charges including aggravated harassment and unauthorized use of a computer.